Updated item sheet, now with some custom recipes (requiring an ingredient I still have yet to sprite), and a more modern Mystery design. Oh yeah, and a lantern, which is a somewhat useful combat item. Custom boss, not based on any existing Mario characters/species (though there are some homages to Tubba Blubba's Heart). And yes, the body is supposed to be simplistic. If you're familiar with unused badges, you should be able to guess what the red frames are for. Made this an edit to fit the game's style better, I plan to change this a bit more when I'm less tired. You're really digging through the archives! Great job! 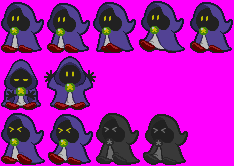 As a maker of custom Paper Mario sprites myself (you can see an excerpt in my sig), I can say these look pretty good. 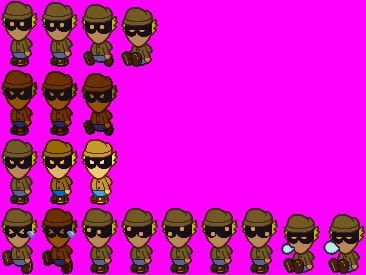 Though my only qualms are with your 100% custom sprites, they look a bit blocky and unrefined. Is it only the enemy sprites that have that problem, or...? The Boo Guy finally has a real attack. No, it's just your 100% custom sheets, the ones that look like you made them out of scratch (talking about the bodies). For the Boo Guy idle animation, try flattening his torso a bit, he looks a bit too tall. The rest look fine. I'd love to see these animated. If you want to alter his arms so they face towards you (like regular Boo guys) then you might want to do that but if that's too much work for you then it's fine to leave it as it is too. I could do that pretty easily, but I have it like this as a stylistic choice (though I'll make a frame similar to that for when it's passing a bomb around). Oh my! I remember these guys from the Pumpkin Zone. The fangame's actually going to have a lot of Super Mario Land series enemies (though a lot of them are pretty uncommon).